3 shades of coffee and chocolate tones for magnificent mochas featuring a 5.8 (Light Mocha Brown), a 6.8 (Dark Mocha Blonde) and a 7.8 (Mocha Blonde. As with all the DIALIGHT shades, the Mochas have L'Oréal's innovative acid-gel formula that's free from ammonia, so won't lighten or sensitise hair. 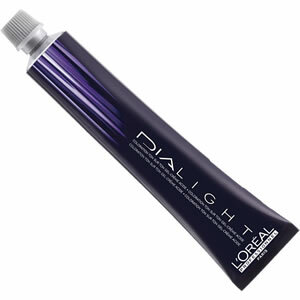 Instead DIALIGHT delivers luminous reflects and gorgeous shine with great condition, making it perfect for coloured hair. 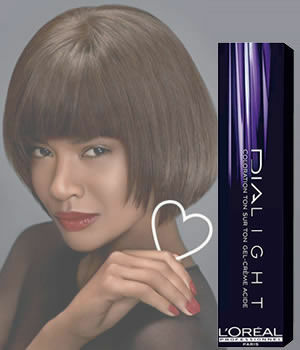 Its shades are perfect for refreshing an existing colour between two permanent hair colour services. To get the best results from DIALIGHT, you need to mix it with its specially created developer DIACTIVATEUR. Mixing ratio is 1 part colour to 1.5 parts developer and development time is just 20 minutes. Buy any 11 tubes of L'Oréal Diarichesse or Dialight and pay for only 10, taking the average price per tube down to an amazingly low £6.54!! Cream developer in 3 peroxide strengths (6, 9 or 15 vol) specifically designed to work with L'Oréal's next-generation tone-on-tone hair colour ranges: DIARICHESSE and DIALIGHT.